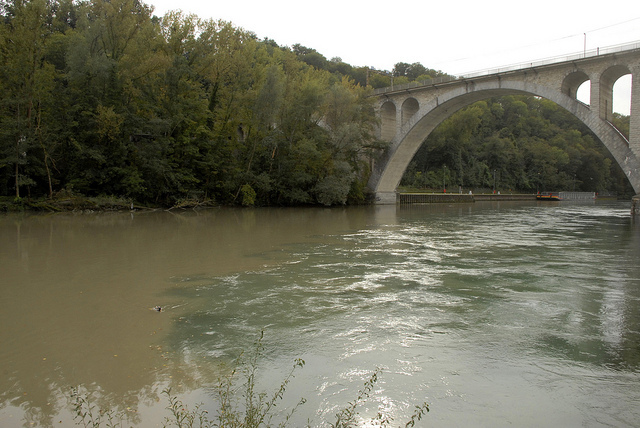 The Rhône and Arve rivers join just east of downtown Geneva. 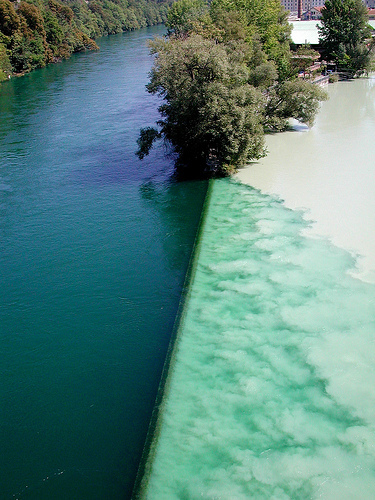 Before the Rhône's green water swirls in completely with the Arve's brown, the two rivers seem to resist each other, almost forming a line -- green on one side, murky tan on the other (after looking at lots of pictures, I think there's actually a low wall that intensifies the effect). The first time I saw the confluence, I was on the bridge that spans the rivers just above the junction. I had a perfect view of the rivers meeting and the V of land that ends their separation. The colors stopped me that day, and when I returned to Geneva last month with my husband, I wanted to show him this spot. I'm good with directions and can usually find my way back to places I've been once without too much help from Google. So I led my husband down the banks of the Rhône, reassured by signs warning us against swimming (the icy Arve waters were just around the corner!). Still cool, but not as good. Check the map, people Linda.